I went to bed at 12:30, practically praying I’d sleep in longer than usual. Woke up early, managed to go back to sleep, and got up at 6:00. Weee! Had breakfast, did online stuff and then it was time to get ready to go to mornin training. I was pretty tired, but had a good time. I didn’t want to do striking, so I waited until Toda-san finished hitting mitts so we could do grappling. Then Celine came and we did some grappling drills. Then we sparred, and it was fabulous! XD GRAPPLING FTW! I met Alex for lunch at Big Boys and enjoyed the grilled chicken and salad bar. She won’t let me take her picture. 😛 <3 I intended to treat her, but ended up treating ME! Thanks, Alex!! <3 She also got me PRESENTS! LOOK!!! Merchandise from this pointless but adorable mushroom growing game I'm playing! 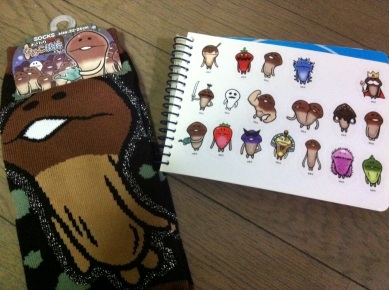 (nameko saiba kit) Stickers, which I have stuck all over the place and also in my sticker book (yes, I have a sticker book) and SOCKS!!!!!!!!! MUSHROOM SOCKS!! LOOKIE!! I skipped evening training because I’m exhausted and sore. Alex went, though. I watched the 2011 movie “Contagion.” It was pretty dark, but well done and I enjoyed it. I liked how they ended it. Everybody’s talking about Invicta- it’s this weekend! I can’t wait to hear what happens. I can’t watch cuz I work, but Alex might be able to? I’m jealous- I wanna fight on Invicta, but I have to STOP GETTING HURT and I still have to develop my hissatsu waza. ~_~ I got it once today! 😀 But I gotta be cranking them out all the time in order to satisfy myself. Good luck fighters, good luck promoters! !